Please refer to Penn State's Policy SY16 Regulations before operating bicycles, moped, skateboards, scooter, in-line skates, roller skates, and electric personal assistive mobility devices on campus. 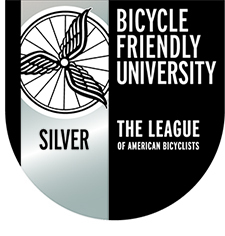 Bicycles shall be ridden on approved bicycle routes and campus roads only. Riders must walk their bicycle at all other places. Specifically, bicycles shall not be ridden on sidewalks or on any pedestrian path in the limited bicycle zone, bounded by Fraser Road, Curtin Road, Shortlidge Road, and Pollock Road. Bicycles may be ridden on malls and pedestrian paths, other than those on central campus, given that the rider exercises due caution and yields to pedestrians. The operator of bicycles on malls and roadways must ride with regard for the safety of pedestrians and property and shall yield to pedestrians. Police Bike Patrols may operate on University walkways for routine patrol duties, when in pursuit of violators, or when responding to emergencies. Bicycles shall be parked on campus at places clearly designated by the presence of bicycle racks. Specifically, a bicycle must not be parked in automobile parking spaces; on lawn areas; shrubs or flower beds; streets; driveways or in any building. This also includes sidewalks, trees, all hand railing, light poles, entrance ways to buildings, or places that hinder pedestrian travel. In the event a bicycle rack is full, the bicycle may be parked upright in the general vicinity, provided it does not impede pedestrian traffic. NEVER ATTACH YOUR BICYCLE TO A HANDRAIL! Any abandoned or non-registered bicycle parked on campus, or any bicycle parked hindering University operations, obstructing steps or a handicap ramp, may be removed and impounded by Transportation Services. If it is necessary to cut a locking device to remove the bicycle, no reimbursement for the locking device will be made. If unclaimed within 90 days after impoundment, it shall be deemed a gift to the University, to be disposed of through appropriate University channels. Any bicycle parked at any location of Penn State shall be parked at the risk of the owner, and should be locked at all times when unattended. At University Park, a copy of the bicycle regulations may be obtained at the Parking Office, at the Kiosks, University Police, or online. At other University locations, a copy may be obtained at the Business Office.